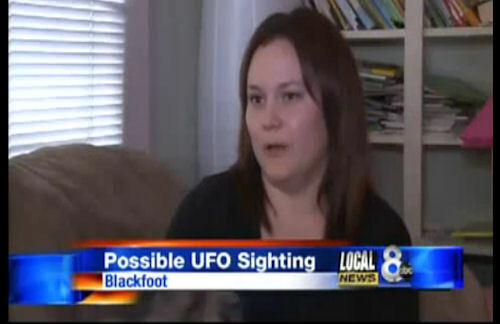 Weird Things » Blog Archive » Several Blackfoot, Idaho Residents Report UFOs! Several Blackfoot, Idaho Residents Report UFOs! People in Blackfoot, Idaho are reporting something weird in their skies. Local Tara Pagan, who stated that her whole family is comprised of skeptics, witnessed a strange group of orange balls of light in the sky that kept changing formation. Pagan snapped the typical blurry ufo photo while her cousin called the first people we’d call if something like this were to happen…the fire department. Expectedly they claimed to have nothing to do with what they were witnessing. Going online, Pagan found a phone number for Peter Davenport of the National UFO Reporting Center. By the end of the night six calls about the same object had been reported. The mystery of why you’d call the fire department to report a UFO continues to baffle only us apparently. I live in the rural area of Blackfoot and the fire department is the closest and only thing around for any type of emergency. Plus she was probably a little shook up.